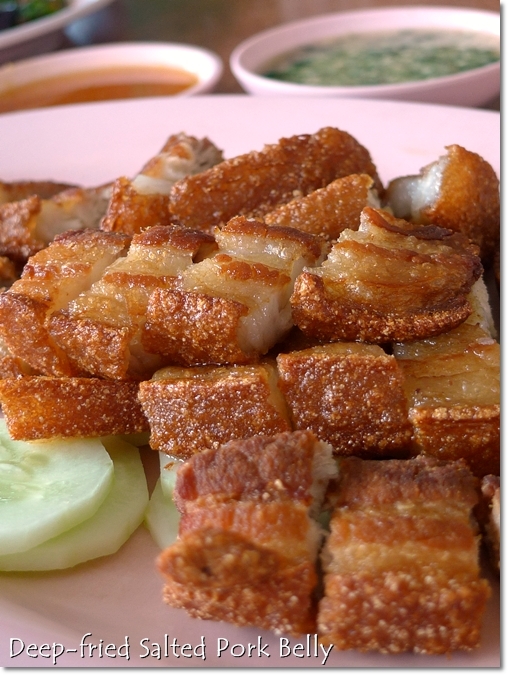 The signature fried salted pork belly from Fu Man; if you don’t mind the fatty cuts, then this platter of absolutely scrumptious and crispy pork belly should be up your alley. Aside from the famous Tanjung Malim pau from Yik Mun (which was nothing to shout about anyway), I have never ventured out of my cocoons and seek for good food around Tanjung Malim; the southern most town of Perak sharing its border with Selangor. (Although Hutan Melintang/Bagan Datoh to the southwest of Perak also shares a border with Selangor’s Sabak Bernam). Rather, on most days we settled for the same old Pun Chun duck noodles in Bidor, Choy Kee’s famous pork knuckle in Sungkai and even Slim River’s claypot fish and bullfrogs. Fu Man Restaurant can’t be seen from the main road, hidden by the current construction works (maybe widening of roads, but JKR works in mysterious ways ….). But just follow the signs to UPSI (Universiti Pendidikan Sultan Idris) and you should be on the right route. 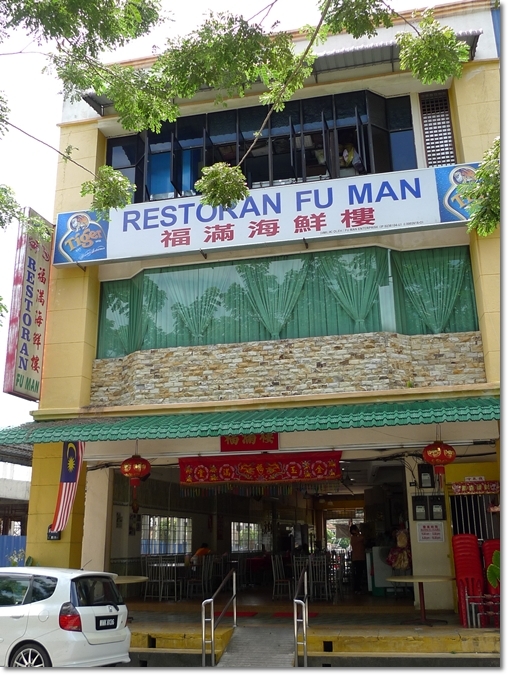 Imagine of all people, I heard about Fu Man from a group of foodies from Singapore! Yup, thanks to Martine and his battalion of food enthusiasts when we met in Ipoh (albeit for a very brief period), I came to know about this somewhat hidden gem in Tanjung Malim; serving fresh and delicious seafood, pork dishes and at affordable prices to boot. We ended up buying home a DOUBLE serving of their famed deep fried salted pork belly, and a portion each of the braised pork belly with yam slices and the appetizing vinegar pork trotters. Their rendition of the Four Heavenly Kings; minus the stinkbeans (petai). Brinjals, long beans, okra (ladies finger) and four-angled beans stir-fried in sambal sauce with dried shrimps. Had it not for the GPS, we wouldn’t have been able to find Fu Man. Since the restaurant’s hidden from the main road leading to Tanjung Malim town (we were heading up north from Kuala Lumpur’s direction), no thanks to the (perpetual?) road-widening process. The restaurant occupies two floors, the upper one equipped with air-conditioning units. Maybe this restaurant is the equivalent of Bidor’s Tien Tien Lai, or Kampar’s Kam Ling Restaurant. A top favourite when it comes to wedding banquets and functions? Beautiful cuts of half lean-half fat pork, marinated lightly then deep fried to a crispy finish. Good enough to eat on their own, but you MUST NOT neglect the plates of sauces that come along with this! Can’t decide on which one’s the better one? Dip the pork belly into BOTH, then savour the ultimate clash of flavours on the palate; Sweet, spicy, sour and savoury. The Four Heavenly Kings (4 Dai Tin Wong) arrived first, with a rather disdain/bleak appearance. But do not judge a book by its cover. 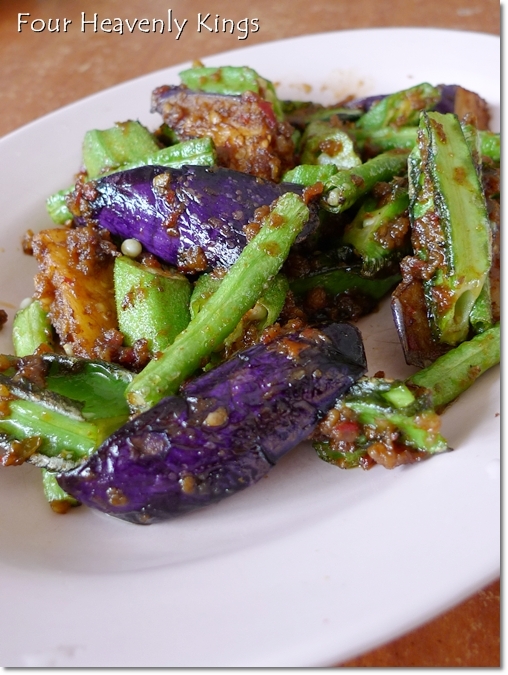 One bite into the ensemble of crunchy four-angled beans and long beans, sweet brinjals (aubergine) and soft okra stir-fried with lots of dried shrimps in a pungent sambal-based sauce revealed the mastery of the cooks in the kitchen of Fu Man. Not overly greasy, or having the greens swimming in a pool of oily sauce, the combination of flavours and texture made for a very tasty dish of vegetables. This may even appeal to non-vegetable lovers. Yup, the carnivores out there take heed. But the STAR of the day, had to be their signature dish of Deep Fried Salted Pork Belly. A classic dish seldom seen on the menus nowadays (according to Mum, at least), the proportionately cut half fat-half lean meat was skilfully cooked then deep-fried before serving the platter of monstrosity (in every sense of the word!) with two very appetizing sauces. One being a sweetish chili and plum sauce (or was it lemon?) 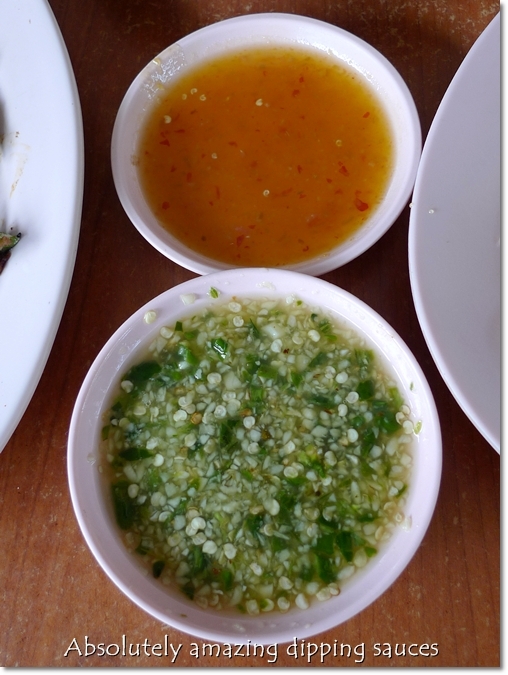 combination, while the other one (my absolute favourite) had a very tangy kick from the kaffir lime juice, finely-chopped fresh garlic and bird’s eye chillies. Traditional stuff; their homemade Yong Tau Foo deserves a mention for the flavoursome patty of minced pork and fish paste. Since there were only two of us, we could only walloped three dishes. Before calling all the stops. The smooth beancurd stuffed with generous fish and pork patties topped with chopped scallions was most definitely the mildest dish of the afternoon. Easily likeable, you can imagine this dish being ordered to offset the heavier seafood and pork dishes. But wait, I could not risk the thought of going all the way to Tanjung Malim again and again for the other offerings from Fu Man. And thus we ended up with packets of braised pork belly with yam slices (“Woo Tau Kau Yuk”), and Vinegar Pork Trotters to be consumed for dinner back home. 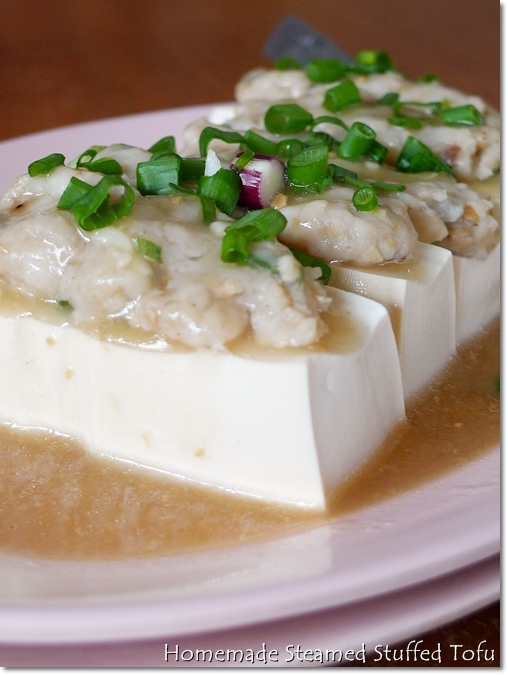 And grandma is such a fan of traditional, Hakka cuisine that scream for white rice! Like a painted picture with hazardous intention; this plate of succulent and tender slices of pork belly braised in a soy sauce-based moreish gravy with yam was polished clean; leaving me with a pathetic slice of pork and yam each for a late dinner. Hmm. Still craving for more pork? 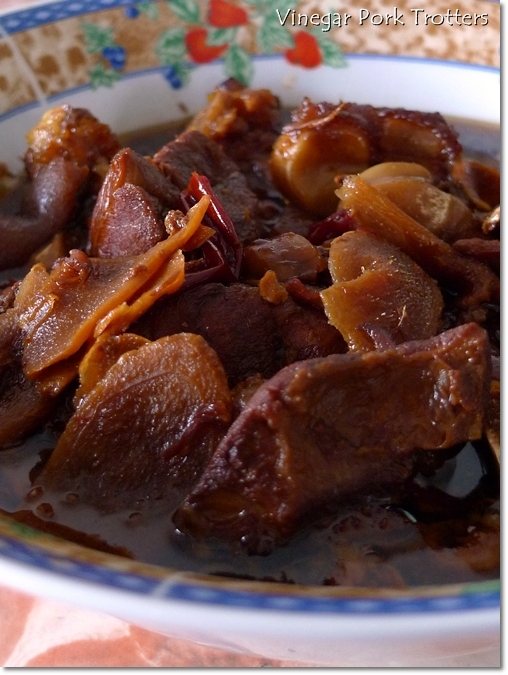 Get the Vinegar Pork Trotters from Fu Man. With slices of ginger and dried chillies for extra oomph. The meal came to less than RM100/USD32 inclusive of all the dishes taken home. 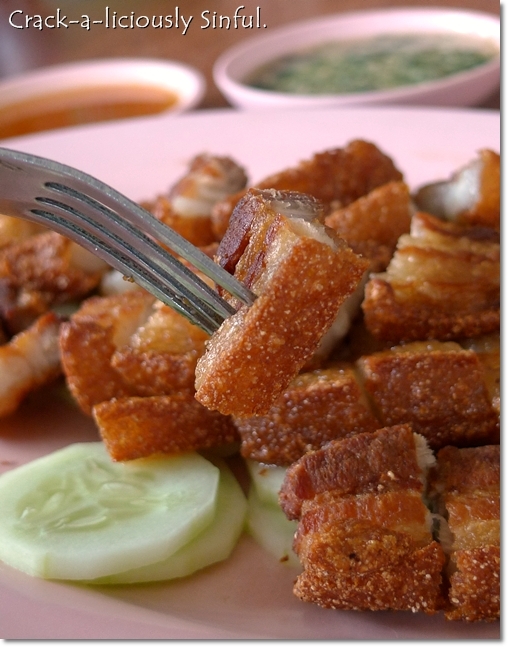 The deep fried pork belly was priced at RM15 per portion, while the other pork dishes were priced at about RM16 each. The plate of vegetables and stuffed beancurd cost about RM6-RM8 each. Gosh,the roast pork looks awesome. It alone is enough to get me to pay the place a visit. Thanks. The sauce…goodness…so many chilly seeds. Must be very spicy huh! Hey, only there were only TWO of us that afternoon! And we ordered 3 dishes. Can’t be serving us with Medium-sized portions right? I believe the fat layer of the fried pork has melt in your mouth texture huh…? Huh, epitome of SIN indeed. Crunchy layers of fat coupled with tougher lean meat, first braised then fried. Then dipped into the combination of sauces. I crave for the pork even now …. 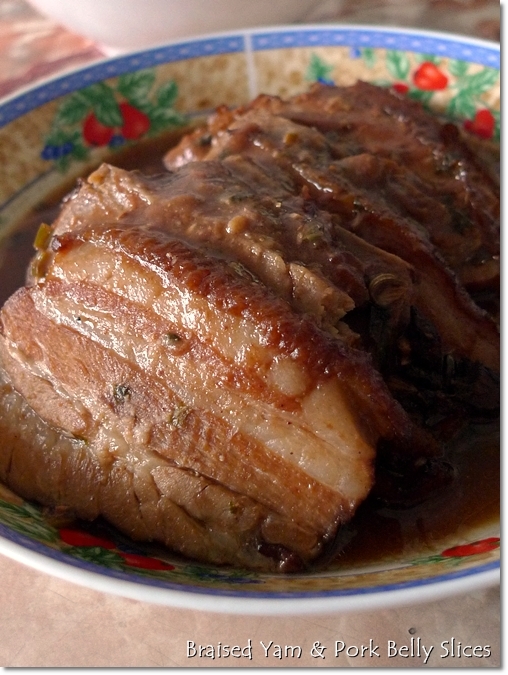 i gotta show my dad this post… looks awesome the pork! Where is the place, DT? I think I have seen the dish somewhere. Weng Kee in Ipoh Garden South? Did fertility Doc use own sperm to inseminate women.